The original Color Correct light, Full Spectrum fluorescent light bulbs with a natural light spectrum. High CRI, Color Correct LED light, Full Spectrum fluorescent light tubes with a natural light spectrum. 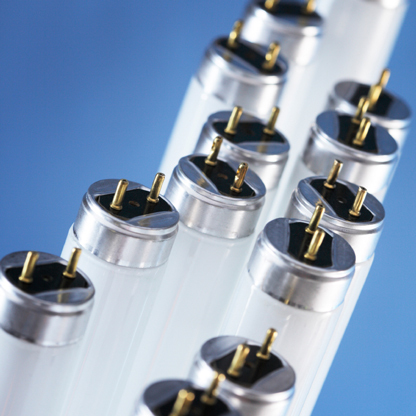 New T8 LED Tube Lights run without ballasts! Lumens 4' T8, 1800- 2600! RDC, bi-pin, single pin. LED installation and ballast bypass now available on local orders! Understanding color-correct lighting starts with knowing the benchmark of natural sunlight. The amount of color you see in the chart above represents the spectrum volume of color under each type of light. All light has two main, light-rating measures. 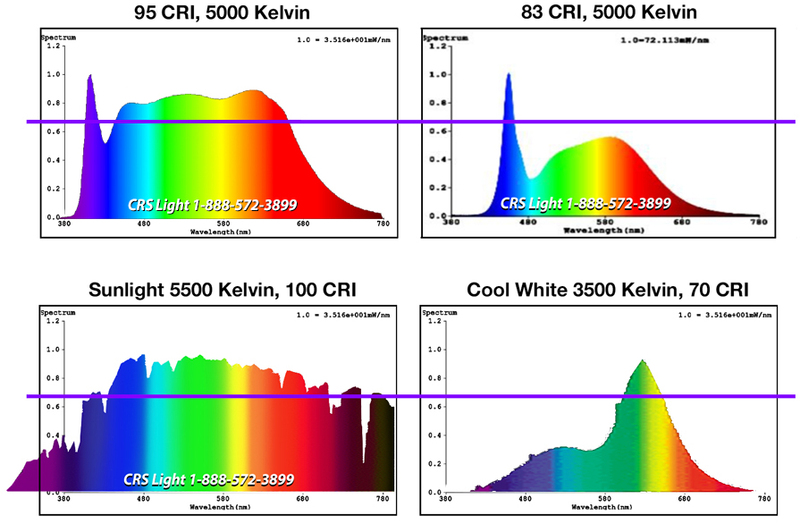 One is a CRI (Color Rendering Index), and the other is a Kelvin rating. The natural sunlight color temperature has a CRI of 100, and a 5500 Kelvin rating. The main quality of an excellent color temperature bulb, is its color rendering capability. The closer to 100 CRI you can get, the better. Looking directly at a light and its light ambiance, is the Kelvin rating. The very top photo helps communicate those numbers visually. To simplify the comparison, each chart has a volume of color, that is what you'll see more of in a room. If a balanced representation of color is what you are after, then you'll want a light that is closest to the natural light. Cool-white light is the light that is furthest away from a natural light spectrum. You'll see that items in a room will appear to have a greenish cast on them. Notice how the yellow and green peaks.